Property Details: 1 Bedroom, 1 Bathroom Vacation Property, Sleeps 4. 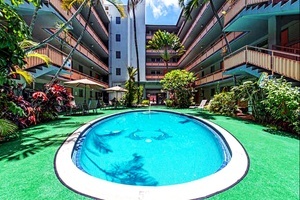 Honolulu Hawaii condo, beach resort vacation rental in Waikiki at the traditional Hawaiian style Hawaiian King Hotel located in the heart of Waikiki just one block from Waikiki Beach where you will experience breathtaking sunsets and sunrises over Diamond Head. Just steps away from your front door is surfing, snorkeling, Honolulu Zoo, Aquarium, Diamond Head Crater, Kapiolani Park, an array of restaurants, exciting nightlife and the famous International Marketplace. Our Condo is a first floor private end unit nicely shaded in the afternoon for a cool relaxing feeling. Both queen size bed and sofa-bed will comfortably sleep four. You will enjoy watching movies on the 27 inch TV and DVD player. Air conditioning and fans in both bedroom and living room will guaranty any cool temperature you desire. A full and spacious kitchen with oven, microwave, radio/alarm will allow you to enjoy cooking at home enjoying time with your family or friends.